This year, I bought a new (used) sewing machine fancier than anything I’ve ever run fabric through. It embroiders, it does a bunch of fancy stitches, and it has an extended arm to help with quilting. It’s been on the dining room table ever since, always with some sort of project hanging from it. I’ve done more sewing this year than probably in the whole rest of my life combined, though it’s a hobby I started before I even turned 10. So, I thought I’d show you a few pictures of projects I’ve completed this year. 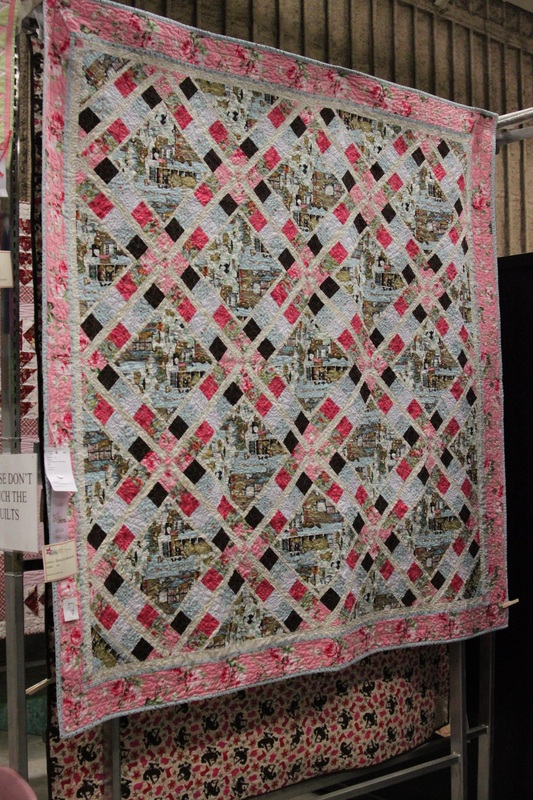 These are all quilts that I entered in the Montana State Fair in Great Falls, July 2014. There is nothing ground-breaking or unusual here, just a few things I managed to accomplish in the months prior. And I am proud of the work I did, especially for not having quilted much in the past ten years or so. The first is a baby quilt for a little boy who is expected in November. Despite having an embroidery machine for months, I haven’t spent a lot of time perfecting my machine embroidery skills. This is actually my first completed machine embroidery project. The Viking patterns are available on Blastostich.com, and come in various sizes. The striped fabric is available at both Hobby Lobby and JoAnn’s (though it is $5.00 cheaper by the yard at Hobby Lobby), and the other fabrics were from my stash. The quilt design is my own. This quilt is 90″x 90″ and is, as of yet, untitled, but was my longest-running project of the year, by far. From start to finish, it took me about five weeks. In fact, toward the end I got antsy to finish it, knowing I was running out of time to finish other projects for the fair. This was inspired by a couple of fat eighth bundles I bought at Wooden Spools in Englewood, Colorado, which I later supplemented with Thimbleberries fabrics from The Quilted Corner in Cheyenne, Wyoming and some Kona Cotton solid from the local Hobby Lobby. 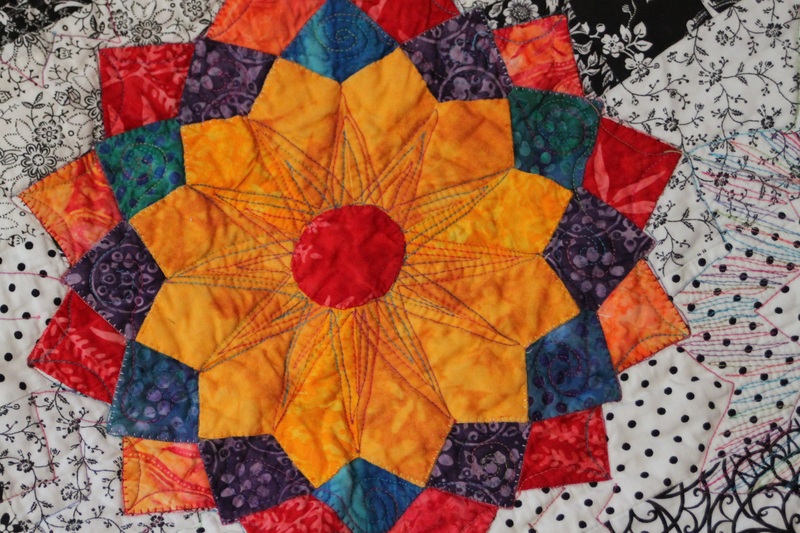 In making this quilt, I fell in love with Dresden plates, and their versatility. This is also the first project I quilted using a quilting template. The feather design comes from an Electric Quilt design pack, and could be resized to any dimensions desired. I printed the templates on wide-format printer paper (using a wide-format Epson WF-7620 Inkjet Printer), and pinned them onto the quilt. I used my domestic machine to free-motion quilt through the paper, and tore them off when I was done. I typically print quilting patterns on 13″ x 19″ newsprint for ease in tearing. The design and setting are my own, though there is no particular complexity to the layout. This was displayed with the large Dresden quilt, and is a wall-hanging made from the one block I had left over. The border was originally made for the large quilt, but when I laid it out, I thought it was too overwhelming to the original design. It was more pleasing to the eye surrounding the single block, so I used parts of it there and incorporated a few new prints. This went together pretty quickly, and was my first attempt at binding around an octagon instead of a square. 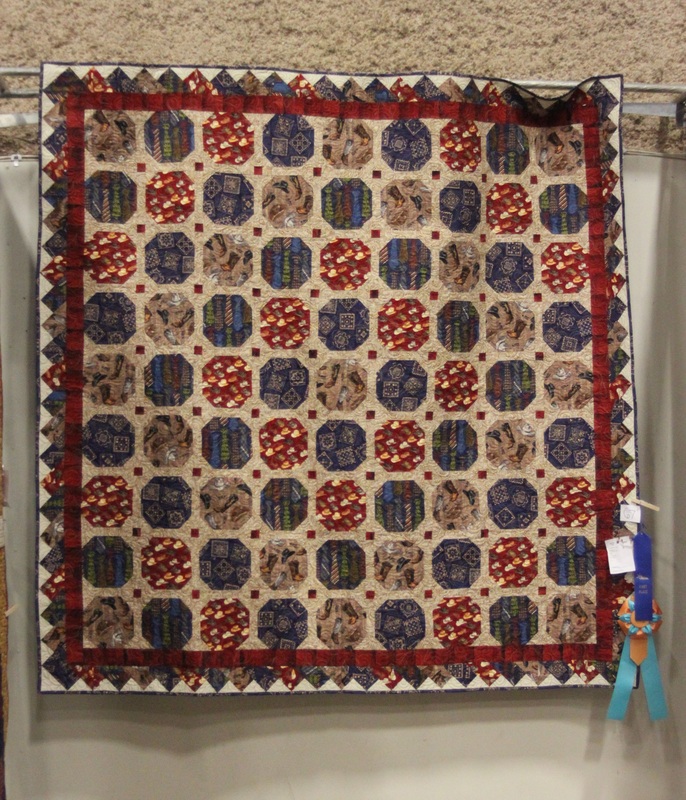 Both quilts won second place in their respective divisions at the fair. 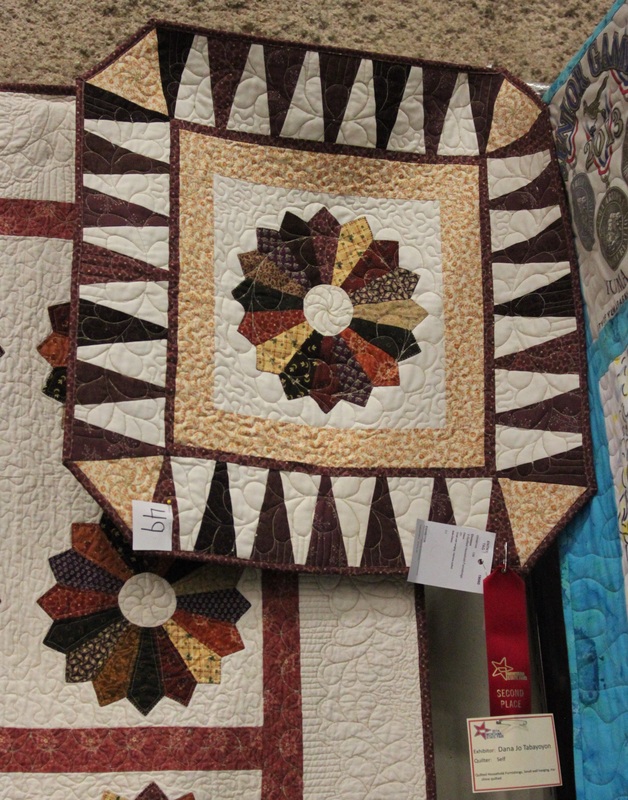 It’s a bit hard to tell, but this quilt has directional fabric in the diamond centers and was hung sideways at the fair, by someone who obviously didn’t notice. 🙂 It’s a novelty print from JoAnn’s, with long-haired cats getting into mischief in a sewing room. Playing in the yarn, hanging from the curtains, perched on top of a dress form…. This quilt was made especially for my friend Erin. I had to make a trip to Great Falls back in March, as I’d been working from home, and they had hired a replacement for me in Ohio. I traveled back to the main office to train him, and was there for an admittedly sad week. The night before I left to come back to Cheyenne, Erin came over to my hotel room, and we talked about quilts she liked. 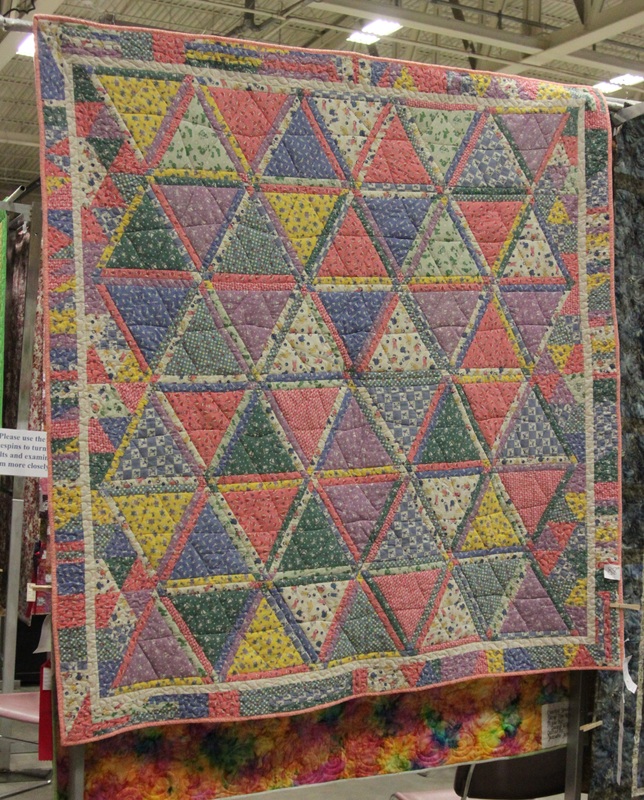 It stuck in my mind that she wanted a “fluffy” quilt (which meant using polyester batting), she loved 30s prints, and among the designs she liked was a triangle pattern, again seen on Pinterest. This quilt, I call “Cowboy Logic” after a Michael Martin Murphy song from the 80s. It was inspired by a snowball quilt I saw on Pinterest using sashed snowball blocks with small squares in each corner. The fabrics I chose shared a cowboy theme, except the blue tie print, which came from JoAnn’s. The red cowboy hat print was from Hobby Lobby, and the Tan boot and hat print was from JoAnn’s. The blue bandana and red barn wall prints were from Hobby Lobby, and the tan bandana print was found at Wooden Spools. 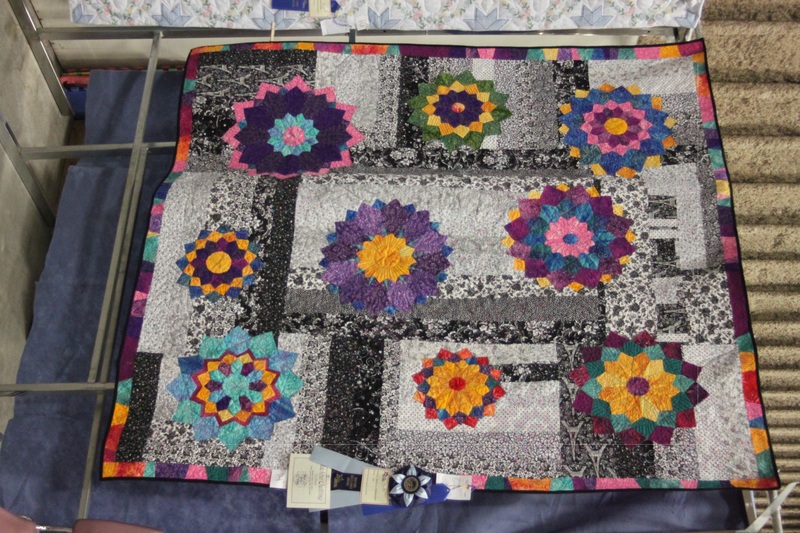 This quilt won first place in its division, and was one of six first-place winners that scored their creators a free queen-sized quilt batting. It was made for my former supervisor at my last job in Great Falls, in appreciation for all the years of good employment I enjoyed there. This is the quilt I finished most recently, after learning so much on the first Dresden plate project. The background is made up of several black and white prints (purchased in 2010 from Equilter), that were left over from another project. When I started this project, I had no plan. Once all the strips were together, I knew it needed more color, and I knew I wanted to use applique. 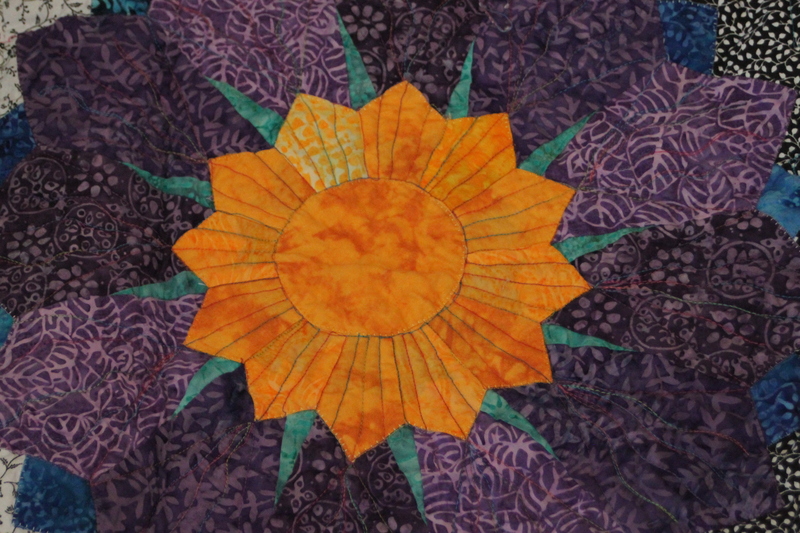 I also knew I had really enjoyed sewing Dresden plates, and that I had a lot of batik fat quarters lying around….and the Dresden flower idea was born. I had seen similar things on Pinterest, but not just prior to the project. Many of those were more involved than this, involving green centers and stems, suns, clouds…in comparison, this one was simple. I made several Dresden plates in several sizes, without much planning ahead. I stacked and layered them by trial and error until I got a layout I liked, then machine-appliqued them down with a blanket stitch. 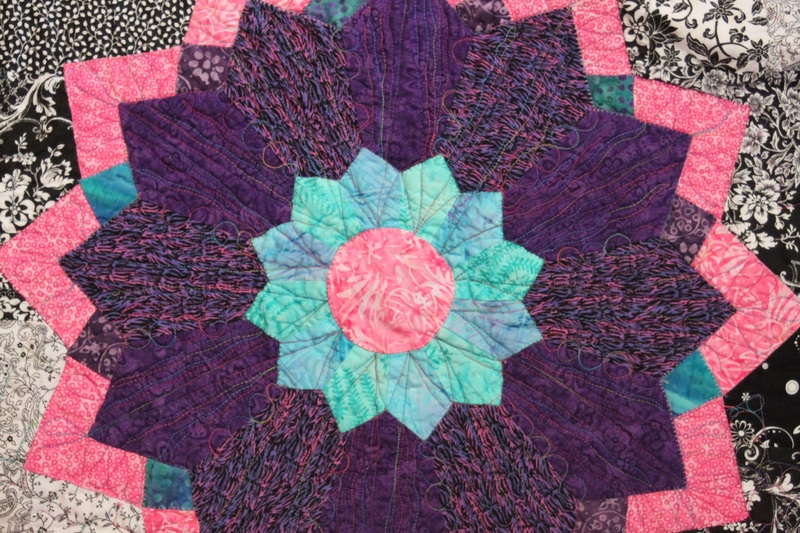 I used a variegated jewel-tone quilting thread by Signature, purchased at The Quilted Corner, (I buy most of my quilting thread there, as Brenda keeps a great selection in stock) and quilted each flower petal uniquely. I then printed several nested twelve-pointed stars on my wide format printer, and used those as quilting templates. I filled in sections of each star with different free-motion fill designs. The wide backing is a mottled magenta and shows the quilting off nicely (I know we need a photo here). It also came from Backside Fabrics. 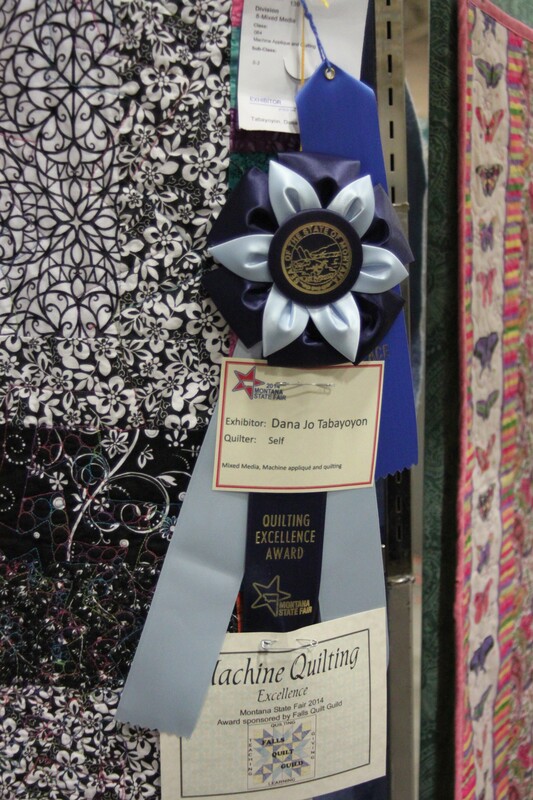 In general, as far as my projects were concerned, at least, the judges at the fair saw all the same foibles that I saw and have not yet learned to entirely fix–problems with knotting, places I had forgotten to trim threads, but at the end of the day they were still very generous with their ribbons. 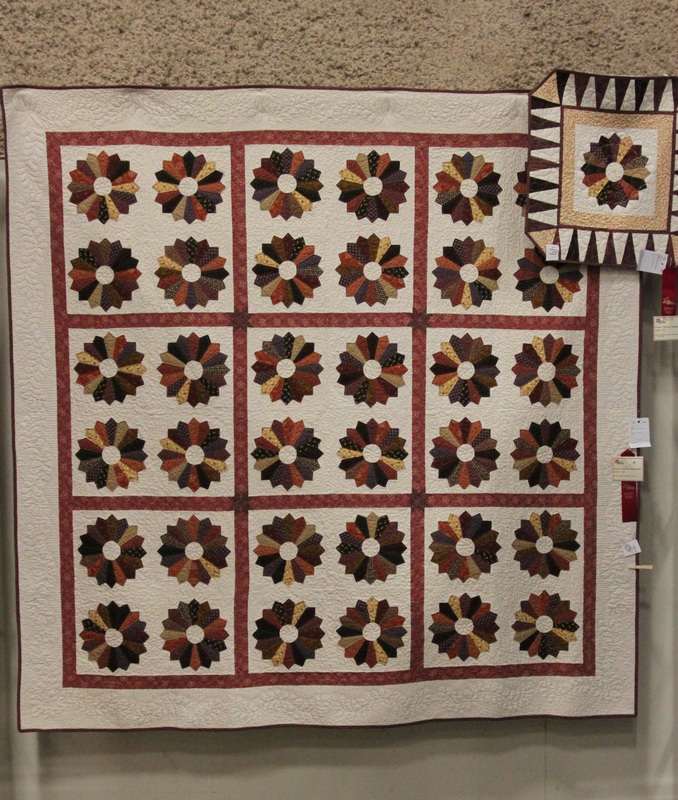 I didn’t make it to see the results of my work until the quilts had been on display at the fair for five days, but there were some nice surprises. 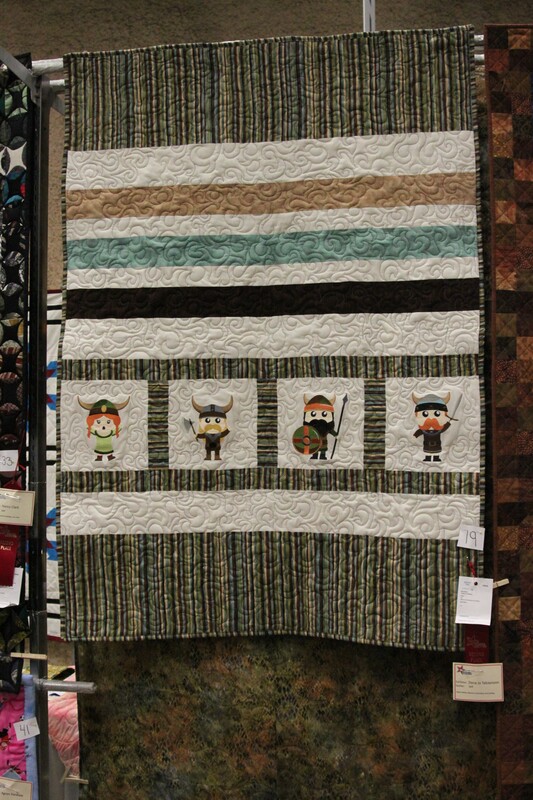 This was the best one, though, as I took home top honors for “Machine Quilting Excellence” in the non-professional category. While there was lots of room for improvement, boy, did that feel great! In true quilting-addict fashion, I am in the middle of several new projects, and haven’t actually quilted and finished anything since before the fair. When there is more, I’ll share again!